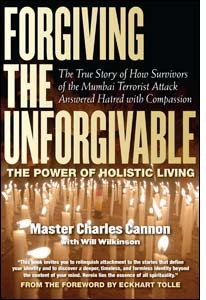 Excerpted from FORGIVING THE UNFORGIVABLE: The Power of Holistic Living - The True Story of How Survivors of the Mumbai Terrorist Attack Answered Hatred With Compassion. In November of 2008, Pakistani Muslim terrorists attacked Mumbai. One of their targets, the 5-Star Oberoi Hotel, was where Virginia based spiritual teacher Master Charles Cannon and twenty-four international associates were staying. During the ensuing 45-hour siege, four in their group were wounded and two long time members were killed. Witness consciousness is the first step. When you are constant in witness consciousness you don't react. You remain a detached observer. You are wakeful, watching the experience that is happening and being well informed about it before choosing a course of action to take. Instead of "Don't just stand there, do something," it's more like "Don't just do something, stand there!" Be still and know... be aware of what is happening and then learn what to do. That's how we did it. "I am a witnessing consciousness in a Mumbai terrorist attack. This is an experience that is really happening and I am watching it. What are my choices here and now?" The knee-jerk, normal response would be a mind running at warp speed, adrenalin pumping up the metabolism and creating a state of hyper alertness. Alertness is vital, but fear-motivated alertness censors your perception from anything other than quickly determining what physical action to take. The mind just frantically searches for the information it needs to survive. Be still. Trust and watch. Of course, you can only trust if you are wakeful, because what you are trusting is something beyond the obvious dimensions. You are trusting in the play of consciousness, knowing that the terrorists are not orchestrating the show-consciousness is. There is something greater than you and them and all that you can see on these dense levels. So, yes, your heart is pumping, everything that is instinctual and primal has been activated and that is appropriate! It's a life and death situation... it's real! But, you are not lost "within" it. Someone lost within it is freaking out all right. "This is terrible, wrong, it shouldn't be happening, why me, what's going to happen..." But that voice is not you. In witness consciousness you allow everything to be the way it is. You accept; you don't resist. You flow with what is happening as the absolutely appropriate momentary happening of consciousness. This awareness doesn't mean you don't feel fear. We were afraid, obviously! Fear is appropriate when your life is in danger! I hope that you understand from what we have presented that if fear is present, the opposite polarity-love-must also be present and that the two will inevitably oscillate together in some way. As far as this world of relative reality goes, there will always be fear, just as there will always be love. And from a truthful perspective, fear in a situation like this is an alarm going off in your emotional dimension that calls your total attention to the moment. Fear is a gift request saying, "Love is needed here!" © 2011 Master Charles Cannon and Synchronicity Foundation.